Raja’ AlZeq, member in one of the We Effect supported cooperatives in Gaza. 2018 marks Gaza’s 11th year in blockade. Close to two million people are today shut out from the outside world. Agricultural cooperatives, that have been supported by We Effect, are now empowering especially women to tackle the grim living conditions. Following the takeover of the Gaza Strip by Hamas, Israel imposed a land, sea and air blockade in 2007. The blockade is causing lack of clean water, food, money, and power. The World Bank estimated in 2015 that the GDP losses caused by the blockade since 2007 was above 50 percent, and entailed large welfare losses. Israel says that the blockade is necessary to protect Israeli citizens from “terrorism, rocket attacks and any other hostile activity. But the blockade has been criticized by former UN Secretary-General Ban Ki-moon, the United Nations Human Rights Council UNHRC) and other human rights organizations. The International Committee of the Red Cross termed it “collective punishment” in violation of international humanitarian law. Women farmers are among those hit the hardest by the blockade. Farming is close to impossible with constant lack of water and power. – The situation is preventing us from so many things, says farmer Raja’ AlZeq, member of the agricultural cooperative in Gaza. We Effect started working in Gaza in 2003 and focused on improving people’s livelihoods through agricultural cooperatives. 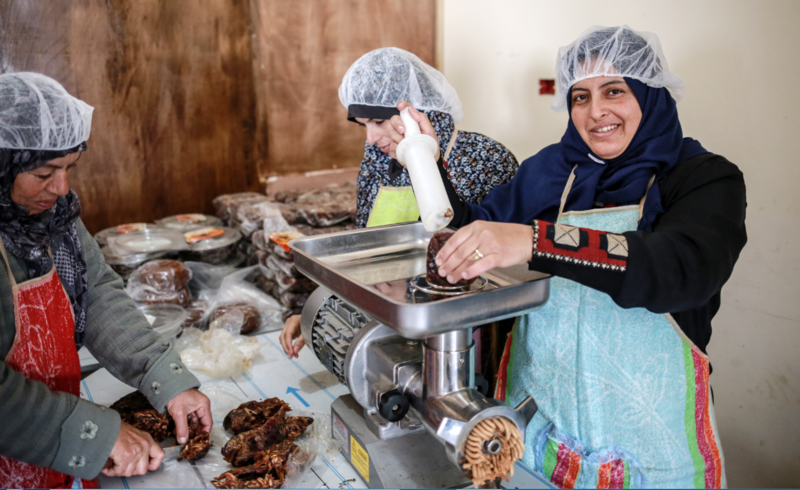 Together with implementing partner Economic Social Development Center (ESDC), We Effect supported the buildup of five cooperatives in Gaza and are currently planning for new projects. For Raja’ AlZeq, the work in the cooperative ““The Cooperative Association for Agricultural development in Khanyunis Mawasi” is giving her a small, but crucial income. – I have a university degree, but there are no jobs. And my husband’s income as a fisherman is not sufficient for our family. Being a member in the cooperative can help me to improve our livelihood. In the cooperative, Raja is working with a group of twelve women from the same area. They harvest and sell dates, and produce and sell “Ajwa”, Date-Paste. They are now, with support from We Effect, among those few Gaza women that have a job. According to the UN, the unemployment rate by mid-2016 was 42 percent. Among women the percentage is over 65 percent. But the incomes are much smaller than they could be. Without the blockade, the women could sell their goods to other countries, to a higher price. – With the right conditions, the cooperative could give all of us a sustainable income during the whole year. I dream of a better future for my children.